After the lean spiritual years of World War II, two major national movements revitalized the American church. One was the evangelical movement spearheaded by Billy Graham and other was the healing revival represented by William Branham and Oral Roberts and a host of other lesser-known ministries like A. A. Allen and Jack Coe. It declared itself as "a signs-gifts-healing, salvation-deliverance, Holy Ghost miracle revival." Between 1947 and 1958 scores of healing evangelists traversed America and went into the entire world praying for the sick. Their unabashed stories are best read in the pages of Gordon Lindsay's Voice of Healing magazine, 100 copies of which are available on a single CD Rom. The revival was an extraordinary, heaven-sent move of God which revitalized American Pentecostalism, revived the preaching of the full Gospel, popularized the doctrine of divine healing and spawned the Full Gospel Business Men's Fellowship International, with Demos Shakarian as its founder. It was the spiritual father of the modern charismatic movement which spans the globe and has transformed international Christianity and affected almost every known denomination. Thousands were healed, tens of thousands were converted, droves of missionaries were sent to the unevangelised masses, churches were planted and nations were seeded with the Gospel. Within twenty years many nations that were affected experienced an exponential church growth which still shows no sign of waning, sixty years on. William Branham is the person universally acknowledged as the revival's "father." 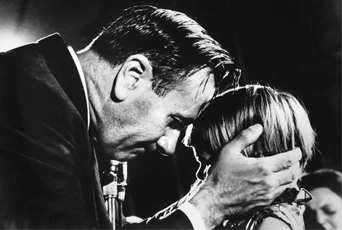 The sudden appearance of his miraculous healing campaigns in 1946, including an astonishing use of authentic spiritual gifts (notably discernment of spirits, the word of knowledge and healing) ignited the dry tinder of American Pentecostalism and fanned its flames into a mighty fire. As reports of incredible healings increased, Branham's fame and ministry grew. He was soon joined by Jack Moore, Gordon Lindsay, and W. J. Em Baxter, who provided a capable management team. Lindsay and Moore initiated the Voice of Healing magazine to publicize Branham's ministry, although it soon became the voice of dozens of healing evangelists. Branham was the primary source of inspiration for other healing ministries who created their own independent ministries. They all testified to the widespread influence of William Branham. David Harrell describes Roberts as"one of the most influential religious leaders in the world in the twentieth century." Harrell contends that Roberts has influenced the course of modern Christianity as profoundly as any American religious leader. From his beginnings in 1947 he conducted over 300 major healing crusades and personally prayed for over one million people, over the next thirty years. He traveled across America preaching and praying in the largest tent ever used to promote the gospel. Another innovation was his national weekly television program which took his healing crusades to millions who had never been exposed to the healing message. His radio program, heard on over 500 stations, also served to propagate the message of healing and deliverance. By 1980 he was receiving more than five million letters annually from supporters requesting the prayer of faith. By the early 1950’s scores of healing evangelists filled tents and auditoriums around the country, attracting tens of thousands of people and reporting thousands of healings and other miracles. In 1950, over 1,000 healing evangelists gathered at a Voice of Healing convention. Second to Branham and Roberts the most well-known were Jack Coe and A. A. Allen. These two became so successful that they began their own magazines sent to multiplied thousands of supporters and took their unsophisticated but powerful message to multitudes across the States. A. A. Allen was by far the most important revivalist to emerge in the early days and he was one of the few that had a substantial following right up to his death in 1970. He was bold and flamboyant with skillful rhetoric and dynamic showmanship. His reporting of miracles, signs and wonders may have bordered on the sensational but no one could deny his pulpit presence, his popular appeal and the amazing power that attended his ministry. 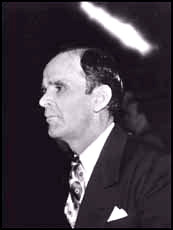 Coe was an established evangelist when the revival broke in 1947. 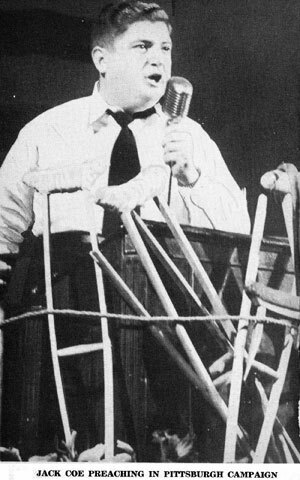 He was a large, self-assured man who had a dynamic personality and stage presence. He rented his first tent in 1947 and soon became one of the foremost healing revivalists. In 1951 he purchased what he described as the largest Gospel tent in the world, seating 22,000 people. 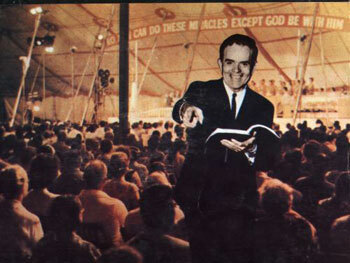 His was the only ministry that seriously challenged Oral Roberts as the popular leader of the revival. Coe had an ability to present the Gospel with unusual power. When praying for the sick, he was full of faith and boldness, often looking for the hardest cases. His magazine, the Herald of Healing, began to be published in 1950 and within one year its circulation had risen to 35,000 and by 1956 it had reached 250,000. Other names should be mentioned as they formed part of the great mosaic of ministries that made the Healing Revival such an effective movement. Gordon Lindsay was the founding editor of the Voice of Healing, with his friend Jack Moore and Jack’s daughter, Anna Jean Moore. The Voice of Healing became the catalyst and voice of the movement, sending its message far and wide. William Freeman enjoyed a meteoric if comparatively short-lived rise to fame in the early period as a clear Gospel preacher and an anointed healer. O.L. Jaggers was another talented and successful leader of the revival, but one who worked from a firm local church base rather than remaining purely iterant. Velmer Gardner, Franklin Hall, David Nunn and W. V. Grant all enjoyed considerable success in the healing revival. A few of the healing evangelists specialized in foreign evangelism, but many of the independent ministers of the 1950s conducted crusades outside the United States, attracting hundreds of thousands to healing revivals in Latin America, Africa, and Asia. The Voice of Healing magazine published reports of scores of extraordinary foreign revivals led by evangelists such as Tommy Hicks and Tommy L. Osborn. 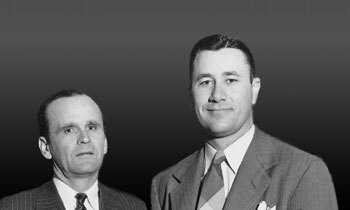 Later Lester Sumrall and Morris Cerullo would take up their baton with a vision for world evangelization. It is generally accepted that the revival peaked by 1957 but its impact and influence extended far into the next few decades as its main message and ministry became absorbed by the ever-increasing Pentecostal and charismatic churches across the world. For more information about the revivalist’s mentioned above please go to the biographical section of this site.